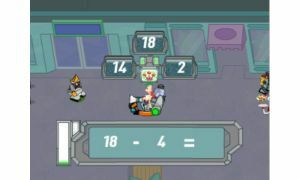 Earn power ups by solving math problems! Get hands-on with STEM (Science, Technology, Engineering and Mathematics) skills to make this the best day ever! Through game play, children will complete circuits with different materials that conduct and insulate electricity, use spatial reasoning to piece together a plan for a water balloon launcher, learn about weights, pulleys and levers as you guide Agent P to his destination, practice addition, subtraction and multiplication skills to power up the balloon launcher and deactivate the stinkbots. This game teaches science skills and is appropriate for ages 5-8 years old. 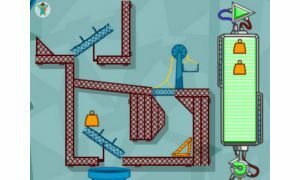 This Phineas and Ferb learning game adventure is designed to give children 5 to 8 an exciting introduction to STEM subjects, including physical science, engineering concepts, problem solving, logic and reasoning skills, and mathematics. Early exposure to STEM subjects lays an important foundation for children’s engagement and success in later school years. Not only are STEM subjects critical to the 21st Century curriculum, they also provide a good context for children to practice problem-solving skills. LeapFrog learning games, apps and eBooks are designed by our in-house educational experts and grounded in the latest research for the richest possible learning experience. By promoting learning through play, we tap into children’s natural curiosity, inspiring them to explore. Children learn more when they’re having fun! As a leader in educational entertainment, parents trust us to combine innovation with a wide variety of play patterns to delight children and expand their learning horizons. LeapFrog toys provide exciting learning experiences to be part of each child’s journey to reach his or her full potential. Explorer Phineas & Ferb game cartridge (compatible with LeapFrog LeapPad1 & LeapPad2 Explorer Learning Tablets, Leapster ExplorerGS and Leapster Explorer gaming systems), Parent Guide & Instruction Book. LeapFrog Learning Library. Take advantage of the library of hundreds of games, creativity apps, ebooks, music, videos and more to keep kids challenged and inspired. From math and science to creativity and reading, we provide fun and engaging learning solutions that adapt to each child’s level and help them build new skills.